Chiropractic care relies on the recuperative abilities of your body just like other healthcare systems. Chiropractic care concentrates on allowing the nerve system of the body to properly communicate with the rest of the body. This promotes healthy activities to reduce the stress (physical, chemical, and emotional). To accomplish proper communication Dr. Sands utilizes specifically selected gentle non-twisting adjusting methods. These adjusting methods have provided excellent results for the many people who have trusted him as their healthcare provider for over 25 years. Initial evaluation commonly includes a non-invasive computer assisted nerve function evaluation that determines how well your body is adapting to your daily stresses. We follow that with spinal x-rays to precisely determine your unique misalignment and the best way to correct the nerve communication. 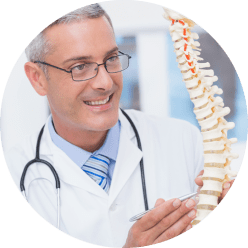 After a detailed evaluation of the computer scan and x-rays, spinal adjusting will begin to help you regain your health and/or prevent future health issues. Other services are available to allow you to improve your overall health.